One of my favourite websites, Hannah Zakari, is celebrating its 5th birthday this week, with 5 days of giving away presents. Of course I am slightly biased as she sells laurafallulah, but it is seriously a great place to buy lots of great handmade items. Click on the present below to see how to enter this fantasitc giveaway. I am definatly going to enter on thursday to try and win one of these amazing Bunny vases made by Pretty Random Objects. So go and try and win some freebies! 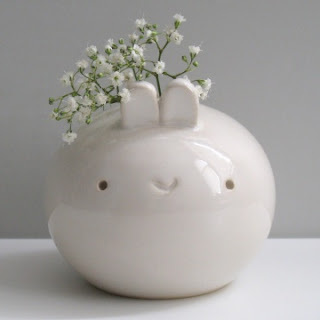 that is one seriously cute bunny vase! So sweet it makes my teeth hurt.